You don’t need a deep love of westerns to get a kick out of Jacques Audiard’s (‘Dheepan’) wry, surprising, and often plain hilarious frontier story set in 1851 Oregon and California. Sure, there’s all the shootouts, smoky saloons and liquor-soaked gunslingers a genre aficionado could ask for, but at its generous heart, the Frenchman’s first English-language film is a road movie about a pair of bickering siblings who just happen to be bounty hunters. The emotional beats are deep-felt and the one-liners come thick and fast. It’s contemplative at times too, taking time to chew over its characters’ hopes and dreams. Imagine ‘Midnight Run’ with saddle sores and you wouldn’t be too far from the mark. Audiard immediately establishes the lethal bona fides of the brothers, Charlie (Joaquin Phoenix) and Eli Sisters (John C Reilly) – and their odd-couple chemistry – with a striking nocturnal gunfight. It begins with distant muzzle flashes and a bullet-ridden cabin and ends, like so many of the scenes to come, with the pair grousing enjoyably at each other. This job, it turns out, was on behalf of the pair’s paymaster, a malicious and mostly unseen figure known as ‘The Commodore’. Soon he has another one for them: to trek across the state and kill a man by the name of Hermann Warm (Riz Ahmed), a guileful chemist with a new formula for refining gold. To make things easier, Jake Gyllenhaal’s detective, John Morris, will have him apprehended and ready to turn over. At least, that’s the theory. In practice, ‘The Sisters Brothers’ has nothing as conventional as a straightforward chase in mind. Tweaking the 2011 novel by Patrick deWitt with his long-time co-writer Thomas Bidegain, Audiard pares back auxiliary characters to draw a bead on this contrasting quartet. Each of them is fully drawn – and beautifully played. Gyllenhaal inhabits the thoughtful, Henry David Thoreau-quoting Morris with a deep-lying sadness, while the ever-impressive Ahmed’s Warm is well named: his belief in his fellow man has been shaken by the prejudice he’s suffered but his underlying goodness remains. This is very much the brothers’ movie, though, and unlike the urbane Morris and the humanist Warm, Charlie and Eli are very much of the Old West. They’re happier swinging punches and wielding irons than negotiating the niceties of a San Francisco hotel. Reilly sells a very funny scene where Eli discovers toothpaste for the first time, sniffing it suspiciously before embracing the concept of dental hygiene with gusto. He finds real depth in the character too. Eli is still haunted by dreams of the brothers’ abusive father and his greatest desire is just to go home and open a shop. Phoenix, meanwhile, has a blast as the trigger-happier sibling, a ball of pent-up id who picks drunken gunfights and is visibly crestfallen when the Sisters brothers’ violent reputation hasn’t preceded them. You’d be hard-pressed to identify this as a film made by the man behind powerhouse prison drama ‘A Prophet’ and gutsy survivors’ tale ‘Rust & Bone’ (although to the deer in the former and the killer whale of the latter, you can add an icky plot curveball involving a spider going somewhere it really shouldn’t). Despite its sizeable body count, it’s a sunnier piece of work than the dreamlike social-realist dramas that came before it. And for a newcomer to the genre – or maybe because of it – Audiard brings real freshness and wit to the frequent gunfights. 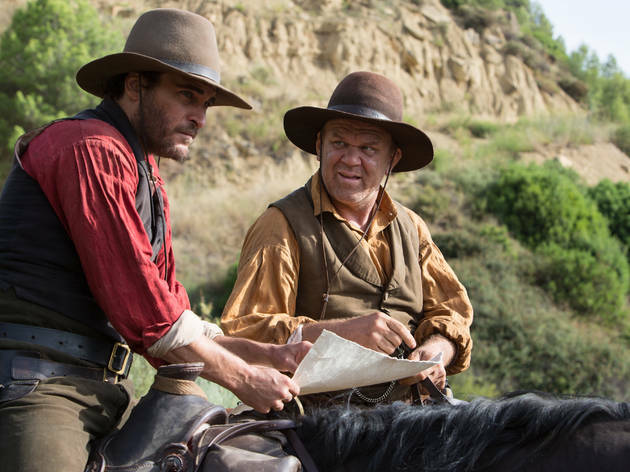 ‘The Sisters Brothers’ may be a violent movie but it’s not an especially graphic one; the bad guys are coolly dispatched from a distance with minimal Peckinpah-y splatter. The one genuinely stomach-turning moment comes at the hands of a surgeon, not a gunslinger. Prepare yourself. After enjoying the extremely accomplished novel, my expectations were high on hearing that it had been filmed. All the ingredients were promising - a top-class director, Frenchman Jaques Audiard (“A Prophet” and “Rust and Bone”) making his debut English language film and a classy line-up of acting talent. John C Reilly and Joaqin Phoenix play the brothers, Eli and Charlie Sisters, professional killers who are hired to track down a chemist with a miracle formula for making gold. Backdrop is the 1850s Oregon gold rush and the brothers’ quest is plagued with misadventures, some very funny and some highly stomach-churning. The movie didn’t live up to its promise - Reilly and Phoenix are too old to be even vaguely credible for long-term gun-slinging survival and the black humour of the original book is lost in the dark and ponderous narrative. A disappointment for this cinemagoer but still well worth a viewing. One of the best films of 2019 so far. Directed by the wonderful Jacques Audiard, all the ingredients really work - wry comedy, luscious cinematography, great score, and terrific performances from a talented cast, not least Riz Ahmed who almost steals the show. The ending will have you close to tears. Movies don't come much better than this. Cinematic story telling at its very best.